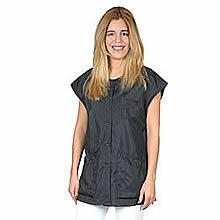 Neat collarless neckline, chest pocket, easy front snaps and large angled bottom pockets. 100% Antron Nylon - Soft, lightweight, cool and comfortable. Hair and water repellent. FabriGuard treated to repel water and stains.